It certainly has had some positive results; making it easier for both parties through platforms such as LinkedIn. Using LinkedIn connects job seekers and employers in tremendous ways. However, social media has also had the adverse effect of making the hiring process so informal that etiquette has become a lost art. Not only are these types of responses rude and disrespectful, but it burns a bridge. As a job seeker, just because you’re not the person for the job today, doesn’t mean you won’t be 18 months from now. But if you call an employer a moron for not choosing you, you can rest assured that they’ll remember you when if you reapply down the road. The same is true for employers. While I haven’t heard of any employers lobbing insults at job seekers, there has been a noticeable lack of etiquette as well. Primarily, by neglecting to keep applicants informed. If your company has whittled down the applicant pool, let the other applicants know. An applicant that doesn’t hear back for months will remember that poor experience, and when they become a highly-desirable candidate down the road, chances are they won’t apply. 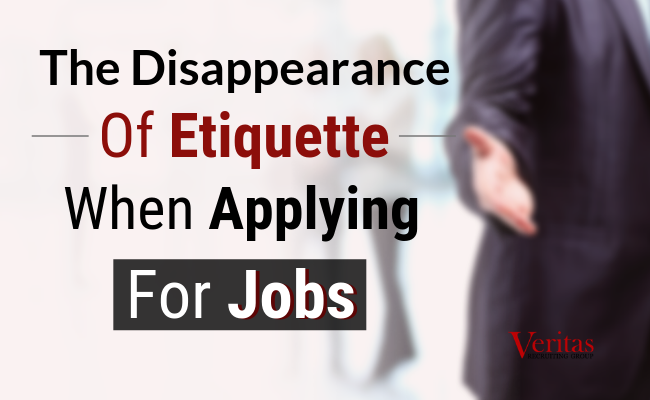 To help both employers and job seekers, here are some quick etiquette tips to keep in mind. Be Respectful of Employers Time: The internet and social media enable job seekers to learn a great deal about a company. Take the extra time to learn about a company before applying. If you apply without learning about a company, you’ll only be wasting their time. Read the Job Description Thoroughly: The job description works for both the employer and the job seeker. Give it a thorough read before submitting your application. Show Appreciation: No matter what happens during the process, show your appreciation for an employer’s time. Even if you don’t get an interview and feel as if your application didn’t receive a fair shake, thank them for their consideration. You never know what the future holds. Create a Thorough Job Description: Don’t try and cut corners during the hiring process. If you don’t create an informative and comprehensive job description, you can’t complain when faced with an unfocused applicant pool. Keep Applicants Informed: You want applicants to respect your time by submitting qualified and well-prepared applications. Show them the same respect by staying transparent during the hiring process. As soon as you know that they’re no longer in the running, let them know. When they’re in limbo during the interview process, keep them updated whenever possible. Keep the Process Moving: One of the biggest complaints that job seekers have about the application process is that they can’t be sure that you’ve received their application. Some hiring software enables employers to send notifications to applicants during each step; informing them when their resume has been accepted and received in real time. If not, try to keep the process moving, especially during the interview process. The internet and social media have made online communication informal, but that doesn’t give us a license to be rude. Maintain your etiquette and respect during the hiring process and don’t say anything online that you wouldn’t say in person. If you’re looking for a new opportunity or need help to fill a role, contact Veritas Recruiting Group today.